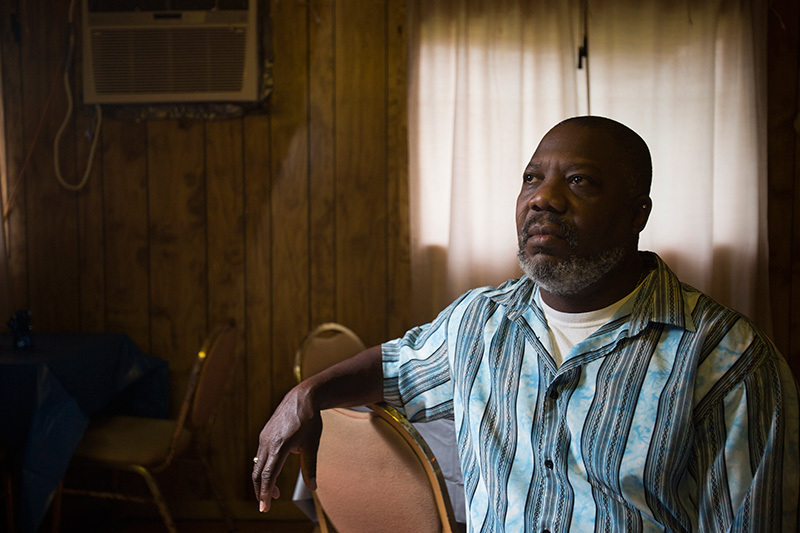 Hilton Kelley is a leading environmental activist who gave up a Hollywood acting career to move to Port Arthur, Texas, a town that’s known for having some of the most toxic air in the country. 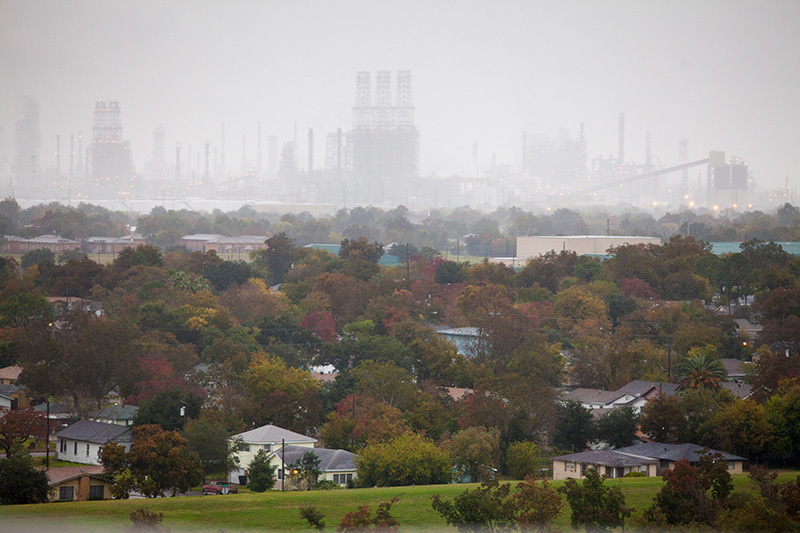 For more than a decade, Hilton has worked to clean up Port Arthur’s air by facing off against industrial polluters that literally surround the town. These facilities include numerous refineries and chemical plants, a shipyard full of diesel-fueled barges, and even an incineration plant that just received a permit to burn chemical waste from Syria. Hilton spoke with Earthjustice's Associate Editor Jessica Knoblauch. Jessica Knoblauch: What was it like to grow up amongst these facilities? Hilton Kelley: I was born in 1960 and back then you just accepted it. We didn’t talk much about pollution and we didn’t understand that there were laws against the release of toxic chemicals. At that particular time, the U.S. EPA [Environmental Protection Agency] was not even in place, so there were very few laws regulating emissions like benzene, a known carcinogen or 1,3-butadiene, a known carcinogen, or other chemicals. All of these chemicals were being dumped into the air then and many are still being dumped into the air today. In 1970 when the EPA came about, I was only 10 years old at the time. The most I heard people in my community talk about pollution is when my brother and I would cover our mouths and hold our noses because it smelled like rotten eggs. We’d make jokes like, “Oooh, who did that?” And my mom would say, “Oh y’all quit playing. That’s money you smell. If we didn’t have that then this town wouldn’t be anything.” You would hear that from people all the time in this community. They would say, “It’s just the smell of money!” That’s the way they looked at it back then. Jessica: I feel like that issue of jobs versus health or the environment comes up a lot. How do you find a middle ground between those two interests? An oil refinery in the distance, with the west side of Port Arthur in the foreground. Hilton: It’s very difficult, particularly when you’re dealing with a community that has basically been raised and developed because of these oil companies. It’s difficult to get people to understand that we have to start pushing for cleaner fuels and looking for ways to get off of fossil fuels when the only thing they can see is getting a job at the refinery because they are the best paying jobs. A lot of folks around here would much rather sacrifice their health to help put food on the table and keep the lights on in their homes. Many of the people in my town have passed away from cancer, brain tumors and other illnesses that I believe are related to chemical exposure. They also believe that, but yet the question remains and the sentiment is: What do we do about it? How can we change it and still have a good quality of life with a decent wage? Most of the jobs around here are either at Wal-Mart or at fast food joints and until we have something to replace those jobs, it’s difficult to even get our local government to take action. I’ve brought these issues before our community leaders many times, like with our mayor and our clergy members. They would ordinarily support an issue that a citizen raises, but because of the very nature of the issue, they’re very reluctant to get involved with that fight. Jessica: It sounds like you’ve gotten a lot of pushback, even in your hometown, and especially in a state that’s not exactly known for being friendly to environmental causes. How do you deal with that pushback? Hilton Kelley, at his restaurant, Kelley's Kitchen, in Port Arthur, TX. Hilton: Well, you’re absolutely right, I am definitely in the belly of the beast—not on the edge, but in the middle of the belly of the beast, here on the Gulf Coast. My technique has always been to speak truth to power, and by that I mean to look at the data, the type of chemicals we’re being exposed to, and educate people on the fact that when you breathe sulfur in, it impacts your respiratory system and it impacts your reproductive system. Scientific proof has shown that. Benzene is also a known cancer-causing chemical. So two plus two is four, no matter how you cut it, so whether you want to deal with it or not, whether you want to go ahead and continue working there or not, the fact remains that you are being exposed. And when you’re being exposed, your kids and your grandkids are being exposed. So, it’s just a fact. We’re not trying to close the plant down, but we are trying to get them to adhere to Clean Air Act laws and reduce the amount of toxins that they dump into the air, instead of paying these meager fines. Because these fines will not give you back your health. Jessica: So you’re saying that we can have both jobs and our health? You have to look at the people around and realize that if we’re going to shut down these plants, then we need to prepare to have a mass exodus of this town. And when you stop and look at the reality of towns like Port Arthur, Texas, then you realize that you really have to change your strategy. The strategy cannot be to shut these facilities down and just go cold turkey. We already have about 14.5 percent unemployment and most of our young people have to move away to find a decent job. Jessica: You also moved away after high school to go to California, first to join the Navy and then to work as a Hollywood stuntman. What made you leave Port Arthur? Hilton: When I left Port Arthur, I was nineteen years old. But the year before I left, at eighteen, I lost my mom to domestic violence. When my mom was killed, she was my sole support. I had to start paying light, gas and water, and life got really tough for me. So one day I was watching television, and a commercial about the Navy came on that talked about seeing the world and making money to take care of your family, so I decided to go for it. I needed to get away because of the death of my mom. It did me a lot of good. After I got out of the service in 1984, I decided to start a family in California, and in 1988, I ended up working in the movie business. I started off doing extras work, and in 1991 there was an opportunity for a stunt to be performed during a fight scene on the set of Midnight Caller. I had a brown belt in Tae Kwon Do, and I passed the test, and from there I got into the Screen Actors Guild. That was one of my crown moments. I’m really, really proud, and I’m still a member of the Screen Actors Guild today. Jessica: So what made you come back to Port Arthur? 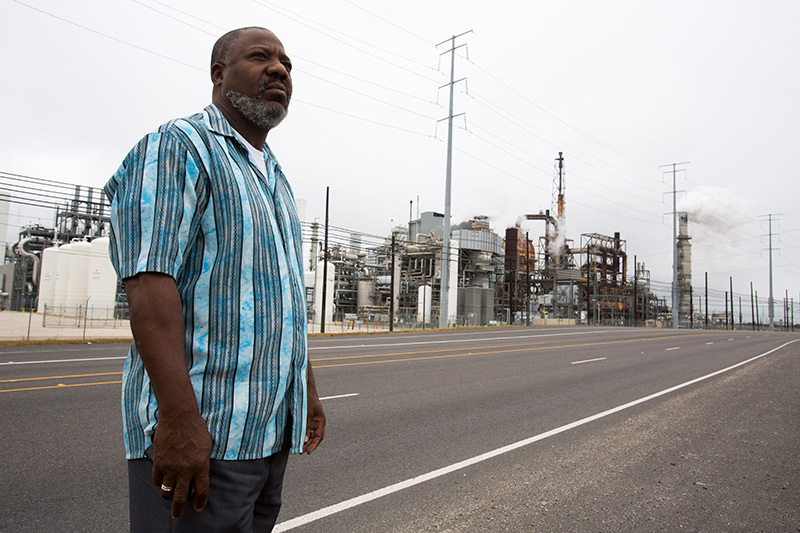 Hilton Kelley stands in front of the Valero refinery on November 21, 2013 in Port Arthur, TX. Hilton: I was working on Nash Bridges in 2000 when I decided to visit Port Arthur, and I was just so thrown back by the dilapidated buildings and the amount of people that I heard had died from cancer. And, the air was still foul and a lot of the kids were playing in the street, and I just felt that somebody needed to do something. I went back to Oakland, California, but I kept thinking about Port Arthur and its needs. I started devising a plan, and I had planned on giving it to someone to take on this fight, but I couldn’t find anyone that was willing or able to do it, so I just decided to come back and do it myself. So by May of 2000, I moved back to Port Arthur and started building my organization, the Community In-Power and Development Association. Jessica: Was it difficult for you to move back to Port Arthur? Hilton: Oh, no doubt. I got into theater and drama back in 1976. I was a tenth grader in high school when I fell in love with theater, and I saw a play called Othello. I went to an all-black school, Lincoln High School, in west Port Arthur, and I was so fascinated seeing those African-Americans up there, speaking that Old English tongue. That whole process of putting together a production and ultimately showing it to people, it just fascinated me. I was living my dream life and was working in the business that I’d always dreamed to work in. I never thought in a million years that I would be an activist, yet I found that I was always an activist once I got into this work because I always cared about animals and about nature. So I’ve always had a really keen sense of taking care of things around me and supporting the underdog, so to speak. So it was difficult to take a sabbatical from going in on the set of Nash Bridges every day, and hanging around Don Johnson and Cheech Marin, but this advocacy work was really tugging at my heartstrings. And because I have so many people that I am related to that were dealing with these pollution issues here, I felt it was my duty to do something to help my community. 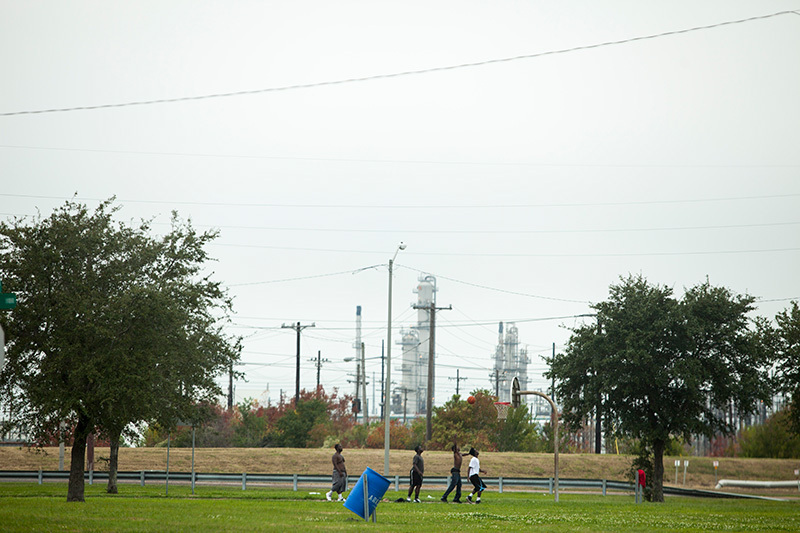 Teenagers play basketball in the Carver Terrace housing project in Port Arthur, TX. As people vacate the project, their apartments are boarded up. The project is slated to be demolished once everyone eventually moves out. Jessica: Was there anything that you could take from acting and apply to your community activism? Hilton: Oh, most definitely. I feel that my work in the entertainment field really helped to prepare me for this work. 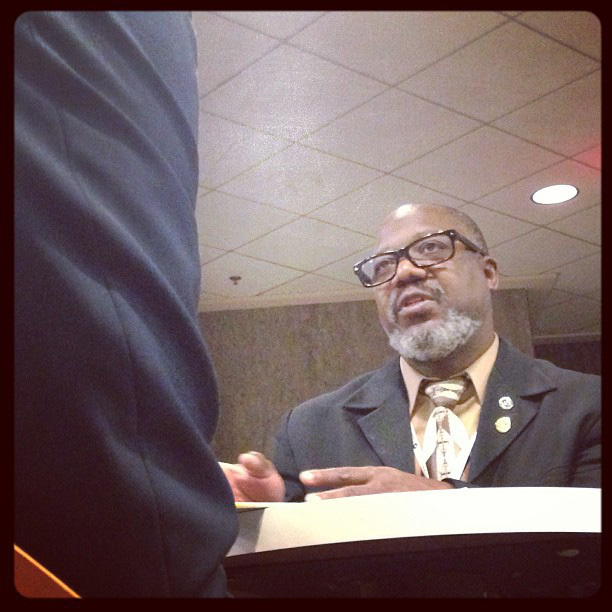 With advocacy, there are a lot of meetings and a lot of proving your point. And I felt that my ability to articulate what was going on, and my ability to paint a picture for folks through my advocacy and through my dialogue, that played a key role in having some of the successes we have had. It was that, along with tons of other people who supported me, with data and information and technical support, and the foundations that made contributions to our organization, that created those successes. Without those folks, I would be dead in the water. Jessica: In 2005, Motiva [the large oil refinery corporation] announced a huge expansion project that was planned for Port Arthur and you were able to convince the company to spend millions of dollars to set up emissions controls and to donate money to a community fund. How are you able to bring such big companies to the negotiating table? Hilton: Well, I can tell you that part really wasn’t easy. We had a study done back in 2001 by Dr. Marvin Legator from the University of Texas medical branch. They had a research team that does health analysis, and they found that people who lived in the cities of Beaumont and Port Arthur were displaying effects that could be directly correlated to the types of chemicals they were being exposed to on a daily basis. We took this information and launched a class action lawsuit against five major petroleum facilities and we finally go to the table through litigation and were able to hammer out these deals. By having that kind of support and being able to keep the pressure on, through advocacy, protests and litigation, all of that played a key role in helping to bring about some of the successes that we have had here in Port Arthur. Hilton Kelley lobbies an aide to Sen. Cruz for clean air protections, during the 50 States United for Healthy Air event in 2013. Jessica: And part of that fight, as you mentioned, is filing lawsuits when necessary. As you know, the EPA recently proposed to regulate air pollution from refineries after years of advocacy and Earthjustice litigation. Tell me about this fight and about your relationship with Earthjustice. Hilton: I partnered with Earthjustice a couple of years ago when they brought me and my organization up to Washington, D.C. [Editor's Note: Learn more about the D.C. event at 50 States United for Healthy Air] We were able to partner with them because we all shared the same issue, which is to clean up the climate. Because of Earthjustice’s push on policy and its ability to organize, the fight to reduce carbon pollutants is really building a lot of steam. It’s a very exciting journey, working side by side with Earthjustice, and I am hoping it continues. Jessica: We hope so, too! As you know, Port Arthur is known for having some of the highest levels of toxic air releases. What do you wish the town was known for and how are you working to make that happen? Hilton: I wish our town was known for innovation in clean energy technology. I wish it was considered a great place to thrive and raise your family. That is what I wish. And to help bring that to fruition, we are constantly pushing to rid our air of dangerous toxins. We are pushing these industries to reduce the amount of dangerous chemicals they are dumping into the air. We are working to build up dilapidated communities. As a matter of fact, we have a brand new clinic that was built on the west side of Port Arthur, which is predominantly an African American community that has been left off the economic vine for many years. That area is turning around now, and a lot of those buildings have been taken down and thrown away, and now we have new buildings going up thanks to state funding. Things are starting to turn around. We are advocating for people to get into community gardening and are looking for ways to create mom-and-pop shops again. This is what we are pushing for, but before any of that will really take off, we must continue to get these industries to reduce the chemicals that they dump into the air that we breathe. We believe there will be a day that these industries are at least 50 percent cleaner than what they are now. No refinery will ever be 100 percent emissions-free, but if they just obeyed the Clean Air Act and the other laws that are in the books, it would be much better for residents here. And that’s what we are pushing for. I am an optimistic person and I am fighter and I don’t see me going away any time soon. We are going to continue to push to change the dynamics here. The people here deserve it, the kids deserve it, and the future generations in this community deserve it. Someone has to take a stand. And if our local government won’t do it, then it’s up to the citizens to fight for themselves. Jessica: And we will keep fighting that fight. Hilton: That’s right and we must continue. It’s the only earth we have. Jessica: Hilton Kelly is the founder and CEO of the Community In-Power and Development Association, and author of the book A Lethal Dose of Smoke and Mirrors: Going home for better or worse. To learn more about Earthjustice’s clean air work, check out earthjustice.org/cleanair. Interview was recorded in June 2014. The people here deserve it, the kids deserve it, and the future generations in this community deserve it. Someone has to take a stand. Down to Earth is an audio podcast series about the news, events and personalities that make up Earthjustice. Hear from attorneys, clients, scientists, and more on Earthjustice litigation. New episodes are released monthly. Subscribe on Soundcloud and iTunes. – Adrian MartinezEarthjustice attorney, on the lack of oversight of the oil and gas industry in southern California.